It is simple steps to generate hello.jar from hello.java (with main() method) using javac and jar, then run the jar using java. option c - create a JAR file. option f - output to a file. last argument(s) can be more than one file that you want to include in your JAR file. 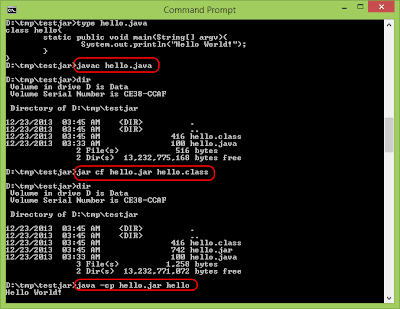 -cf specify the classpath of hello.jar. hello is the class contains the main method.